Ireland opener Paul Stirling is likely to be fit to face the Netherlands in Friday's crucial World Twenty20 encounter in Bangladesh. Stirling retired hurt in Wednesday's win over United Arab Emirates after being hit on the elbow by a lifting delivery from Asadullah Shareef. A scan revealed tissue damage and Stirling will have a late fitness test. Ireland top Group B and will progress to the Super 10 stage if they defeat the Dutch in Sylhet. A sizeable net run-rate advantage means the Irish could still go through even if they slip up against the Netherlands. However, with high-profile matches against England, South Africa, Sri Lanka and New Zealand at stake they will take nothing for granted. "I would be hopeful," said Ireland physio Andrew Dunne about Stirling's fitness. "Without any fracture he can't do any more damage to it but it can still be painful so we'll see how he pulls up on Friday morning." 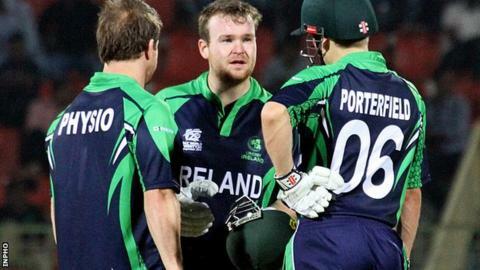 Ireland captain William Porterfield and coach Phil Simmons face a selection dilemma between off-spinner Andy McBrine and seamer Tim Murtagh. They have each played a match so far, with McBrine impressing on his debut against Zimbabwe before Murtagh turned in an equally impressive showing when replacing the 20-year-old on Wednesday. Conditions are likely to suit spin bowling and if Ireland cannot utilise Stirling's deceptive spin, then McBrine's chances of playing would seem to be increased.